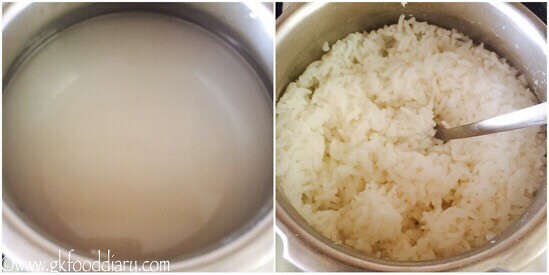 Wash the rice in running water twice and add two cups of water to it. Pressure cook it for three whistles in medium flame. Once pressure releases, open and mash the cooked rice with a laddle. Let it cool down. Finely chop green chillies, Coriander leaves and ginger. Set aside. Heat a tadka pan with oil and add the items to temper in order. Let the mustard seeds cracks and urad dal turn brown. Add curry leaves, green chillies, cashews and ginger now and fry for a minute. Switch off the flame. Keep aside. Wash & peel the skin off from carrots and grate them using a grater. Keep aside. Now add the curd, butter and milk to the cooked, cooled rice. Mix well. 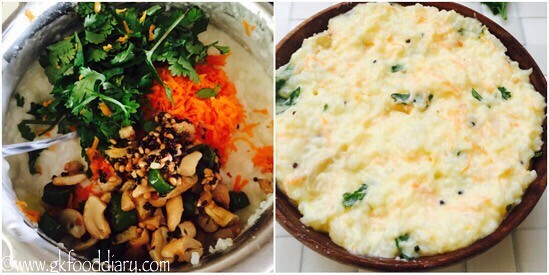 Then add the tempered items, grated carrots and coriander leaves. Mix everything well once again. Serve chilled. 1. Wash the rice in running water twice and add two cups of water to it. Pressure cook it for three whistles in medium flame. Once pressure releases, open and mash the cooked rice with a laddle. Let it cool down. 1. Finely chop green chillies, Coriander leaves and ginger. Set aside. Heat a tadka pan with oil and add the items to temper in order. Let the mustard seeds cracks and urad dal turn brown. 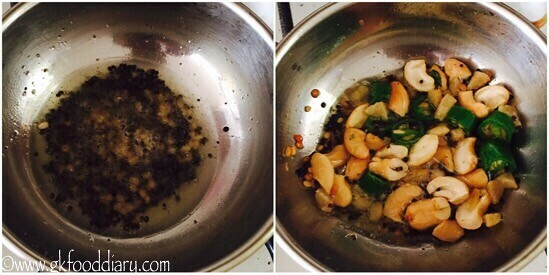 Add curry leaves, green chillies, cashews and ginger now and fry for a minute. Switch off the flame. Keep aside. 3. Wash & peel the skin off from carrots and grate them using a grater. Keep aside. Now add the curd, butter and milk to the cooked, cooled rice. Mix well. 3. 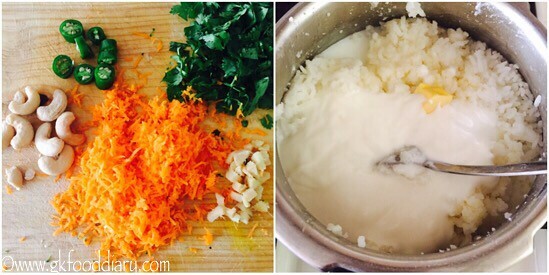 Then add the tempered items, grated carrots and coriander leaves. Mix everything well once again. Serve chilled. You can also add pomegranates, cucumber pieces to the curd rice if you like. 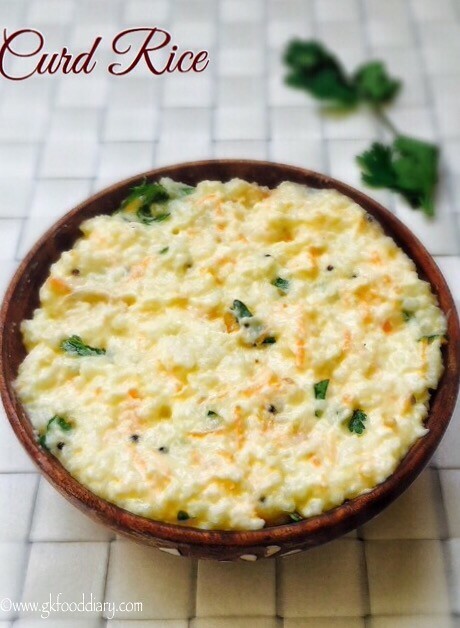 Make sure to add curd only when the rice is cooled down completely. 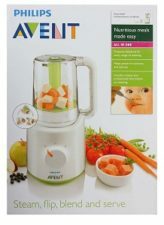 Skip tempering and milk for babies below one year. Also add sautes carrots instead of raw carrots. 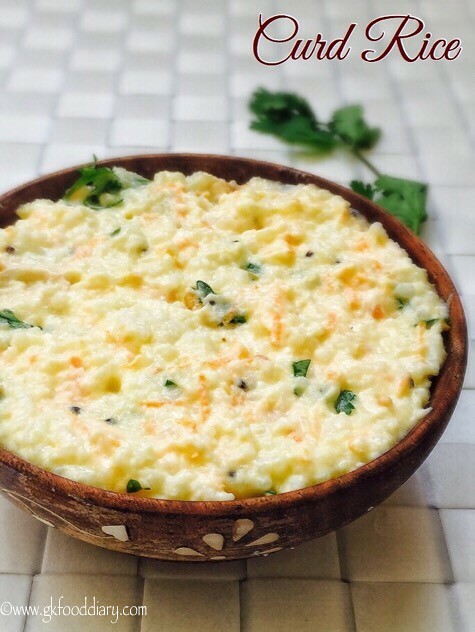 Any normal cooking rice can be used to prepare this curd rice. 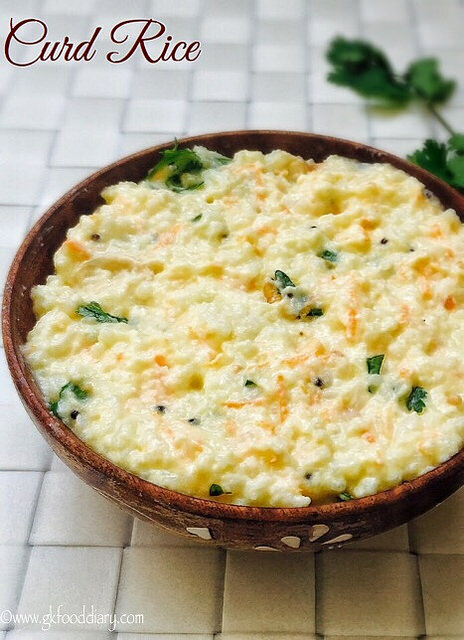 Skip milk if you are serving the curd rice immediately. Add 1/4 cup of milk extra if you are packing it for lunch in order to avoid sourness. You can add powdered nuts instead of whole cashews/peanuts for small babies. Can this be given to 8 month old baby?